Andy Holloway, owner of Baywater Farms, had a recent interview with host Jodi Risse of Food 4 Thought. Recently, our owner Andy Holloway had an interview with Jodi Risse. The recent interview for the program called Food 4 Thought focused on Andy himself, the farm, and how we’ve been growing plenty of fresh fruits and veggies for Anne Arundel County Public Schools. Please read on to learn more! Andy started the recent interview by telling a story about how he’s involved his kids in working on the farm to gain some spending money. But by earning their allowance, they’ve also come to understand the value of money. It turned out to be fun enough that the friends of Andy’s kids all want come to work on the farm. He described it as summer camp, essentially. There’s a lot of history on the farm, as six generations of farmers have called it home over the years. The surviving farmhouse was built in 1904, by Randolph, Andy’s great great grandfather. Here’s a fun fact: the business for the farm was formed in his bedroom. With the best conditions, seeds can grow to full maturity in about four weeks. Under winter conditions, when it’s colder and grows darker sooner, the seeds might take longer – about eight weeks. 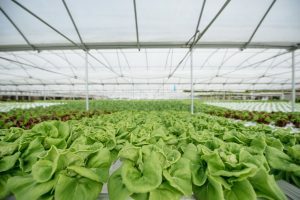 As Andy mentioned in the recent interview, a wet wall is used to trickle down over cardboard in the greenhouses to help regulate the temperature inside by using air fans to move moisture around. Shade cloth is also used to help control greenhouse temperature. Linear surface growing with LED lights is the latest technique that they’ve been experimenting with, too. With spring not too far away, there’s no better time to try our spring mix! The spring mix is our second-best selling product, only behind the Bibb Lettuce. What’s more, it’s all seeded by hand. Funnily enough, the way the spring mix is seeded is by loading up a number two pencil with the five different varieties and then rolling it around in the spun volcanic ash of the rock wall. We found that this was the most effective method, surprisingly. Something we learned early on about growing and harvesting butternut squash – if you cut it open before it’s ready, it won’t be a pleasant experience. From from that came a chance to learn and improve. Andy himself mentioned how, even despite six generations worth of farming experience, he still doesn’t know everything there is to know. But the process we follow in producing our field crops begins with the initial idea, that then turns into research, and then acquiring seeds. A year can pass between the idea and the first planting. But that doesn’t discourage us from trying new things. This entry was posted on Friday, January 19th, 2018 at 1:14 pm. Both comments and pings are currently closed.